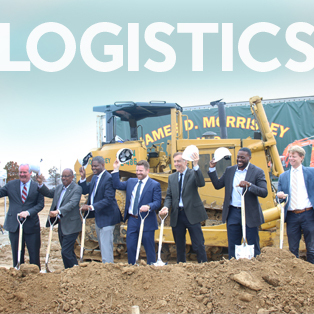 PIDC, JLL, and Ridge Development (a Transwestern Development Company) recently came together to break ground on the 207,500 square foot state-of-the-art Philadelphia Logistics Center located in the northeast section of Philadelphia at 3025 Meeting House Road. This development marks first speculative logistics development in Philadelphia’s history. PIDC President, John Grady; Director of Commerce at the City of Philadelphia, Harold T. Epps; H. Bradford Boone and Brian McCurdy of JLL; and Councilman Brian O’Neil spoke at the groundbreaking to mark the momentous occasion. Since the release of the Philadelphia Delivers: A Hub for Logistics & Distribution report, which outlined the case for logistics and distribution facilities in Philadelphia’s well-suited industrial land, the city has continued to see investments in this industry. The Philadelphia Logistics Center is a prime indicator of the major market growth opportunities. “Philadelphia Logistics Center is the premier location for regional and last mile distributors, and Philadelphia based companies in need of Class A state-of-the-art logistics and distribution facilities supported by a strong labor force to optimize their supply-chain operations,” says Brian McCurdy, a leader of JLL’s urban industrial team in Philadelphia. The Philadelphia Logistics Center is in a strategic location with ideal access to key mid-Atlantic locations via a total of seven highway entrances within 10 miles. It features 36-foot clear ceiling heights, and 50 x 54 column spacing allowing for efficient space utilization or subdivision. Property features also include 242 parking spaces for cars, and 56 for trailer storage. The building will be available for occupancy in the third quarter of 2019.